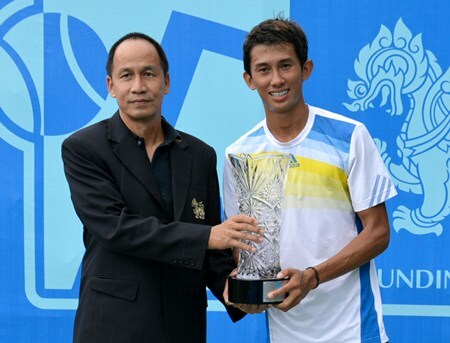 The Singha TATP Tour Championship Tennis Open provided few surprises as top seeds in the Pattaya tournament progressed according to their rankings with No 1 ranked Phassawit Burapharitta winning the men’s singles title. 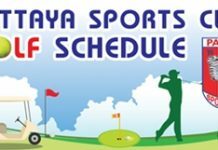 The Sept. 27-Oct. 5 tourney at the Royal Cliff Hotels’ fitness center included both singles and doubles contests for men and women battling for a share of the 500,000 baht purse. There was also a senior-players tournament with 44,000 baht up for grabs. Singha representative Sruang Jantrautai (left) presents the crystal cut trophy to men’s champion Phassawit Burapharitta. With Thailand’s No. 1 player, Danai “Pink” Udomchoke withdrawing at the last minute for personal reasons, former youth champ Phassawit took over the top seeding, besting second-seed Warit Sornbutnark 6-3, 1-6, 7-6 (5) in the men’s final. The champ won 40,000 baht while Warit took home 25,000 baht. No. 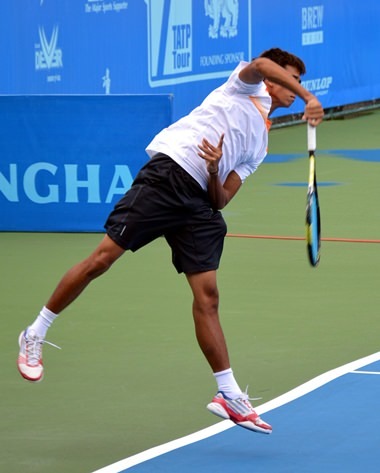 3 seed Singaekrawi Wattanakhul made it to the semi-finals, losing to Warit 6-1, 7-5. The only upset was No. 4 seed Patt Phothitat losing to unseeded Phongsiri Niroj 7-5, 6-4. Burapharitta serves to Warit Sornbutnark in the deciding set of the men’s final. Phassawit also won the trophy in the doubles tournament with partner Kirti Siributwong, beating Pant Puravit and Peerakiat Siriluethaiwattana 6-4, 6-4 to win 20,000 baht. The losing pair took home 12,000 baht. In women’s singles, Kamolwan Buayaem defeated Phatcharin Sheepyadeaj 6-2, 6-2 to claim 30,000 baht with the loser winning 18,000 baht. In women’s doubles, Kamolwan Buayaem and Shanikarn Sasikhul defeated Phatsarin Shipyadeaj and Naphatsorn Seankeaw 6-1, 6-3 to claim the cup and 15,000 baht. The runner-up received 8,000 baht. At the conclusion of the tournament, and for the enjoyment of spectators, The Royal Cliff and Singha also staged a VIP doubles match featuring Thailand’s former World No 9 men’s tennis star Paradorn Srichaphan.